As a company Landford Stone enjoys working with the discerning self builder. Over the years they have been involved in the design and specification of numerous projects where Landford Stones valuable knowledge and experience have been utilised to assist the client to achieve perfection. As part of the service we offer, you the individual can personally select the materials or slabs that will be used on your project. We carry vast stocks of slabs and tiles in our yard to view. Our buyer is a frequent traveller to the quarries and factories in Italy, China, India, Portugal, we have trusted agents buying in many other countries. We can also offer a fully escorted trip to the factories or the quarries to view and select your own materials. Landford Stone have been specified to select rare stones for works in Grade1 listed buildings and recently found marble from a quarry that produced the original floor in a 16th century house .The finished result is truly amazing. We have over 1700 slabs in stock and over 600 different materials. We highly recommend that you send your customers to personally chose their own slabs to be used, whether it be for kitchens, bathrooms or flooring. 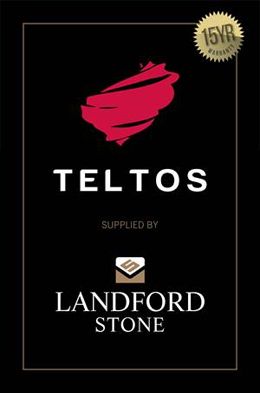 Landford Stone our proud to be the Platinum supplier of TELTOS Quartz. New TELTOS materials due out in September. Fantastic Greys and Marble effect looking stones with all the benefits of quartz including our 15 year warranty. If you would like samples and further information, please contact the office and we will be more than happy to help. Business of the Year finalist for 2014 in Marketing and Manufacturing categories and Involved in the International Award Winning Property In Sandbanks.